Kent's "Hooligan Libertarian" Blog: Disarmed "warriors"
I don't support or appreciate ANY government military. Not here, there, or anywhere, at any time throughout history. There are reasons for that, and I accept that all statists, of every degree, disagree vehemently with me. Regardless of statists' feelings, government militaries are never on the side of liberty or freedom; concepts they can't even begin to understand. That being said, if you have a government military, keeping the participants disarmed seems really stupid. If you are going to have a military, the whole point- the only point- is for them to be armed and able to deal with threats. If you can't trust the participants around each other, or around the "public", while armed, you can't trust them at all. So, either they are untrustworthy, or you are a sniveling coward. Or both. If you can't trust the participants, how can you expect me to? And putting "No Guns" signs on your facilities makes you look ridiculous. 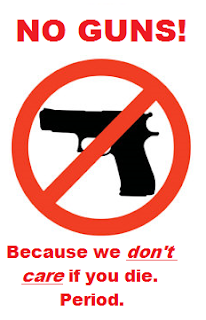 Who is going to take you seriously if you are so scared of armed people that you feel the need to post "We don't care if you die" signs at your doors? I mean, really. You want to be seen as tough and dangerous and all that, and yet you fear me with a gun? Pathetic. Either choose to have a real military, individually armed 100% of the time, or disband and go home, leave the stolen money in the pockets of the people you were pretending to protect, bulldoze the Pentagon, sell off the weapons, and let the militia handle it.